Style.com’s “Top 10 Must Haves for Fall 2011” include a ‘novelty sweatshirt’. Jason Wu, with black lace down the sleeves. I thought “oh, dear – there’s an idea that’s open to mis-interpretation, that can encourage a lot of slurpy outfits”. Poor Tim Gunn, valiantly trying to get people out of wearing sweatshirts and flip-flops. Then UK Elle December 2011 issue published some photos. Which make it clear the idea is not to be well dressed and comfortable while active. 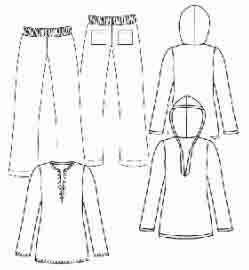 The aim is to look very fashionable, and as if what you are wearing could not possibly have been made in a sweat shop using the cheapest materials and quickest techniques. Nothing to do with being comfortable, either physically or socially. Here are the extremes, wearable to a big city high-concept occasion perhaps. Well, ignore the over-styling and don’t look at the shoes. Then you can see the rest are actually sporty classics, just made in current shines, sheers, and leather. 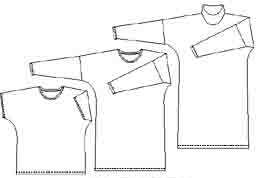 So, if you do want to be comfortable and active in your sweatshirt, but still look as if a designer was involved at some stage, here are some possible patterns. Hot Patterns Weekender Chilled-Out Sweat Suit. 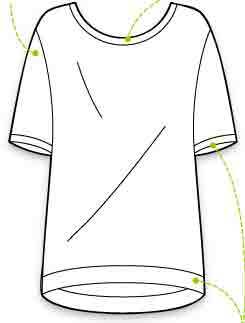 Hot Patterns Plain and Simple Relaxed T Shirts. 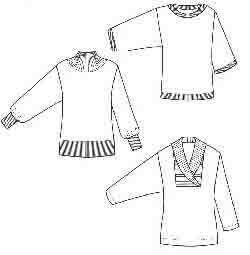 Hot Patterns Plain and Simple Rib Trim Sweaters. Christine Johnson Travel Trio Two top. Loes Hinse Boat Neck top. Want something a little more girly ? have a look at more of the Hot Patterns tops. Even Chanel is showing a ‘polo’ top this season. For extreme Sports Luxe you can get skis with the Chanel logo for $4000. 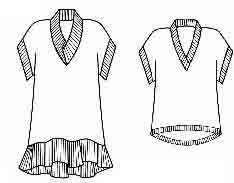 If you don’t want to go that far, copy the polo top by widening the placket and collar on Jalie 2562. Bright colour blocking, and multi-print combinations are also high trend ! The colours available here in sweatshirt fleece are fairly conventional, but there are more interesting colours and fun prints in fleece, and I’m planning a post on patterns for fleeces and hoodies. Use high quality fabrics and enjoy feeling and looking both relaxed and active. 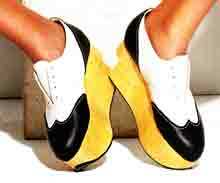 This entry was posted on December 3, 2011 at 10:43 am and is filed under current fashion. You can subscribe via RSS 2.0 feed to this post's comments. Both comments and pings are currently closed. Sports luxe has always been my preferred style (I didn’t know it had a name lol). As much as I love ruffles and fancy dresses on other people, I move around a lot and always gravitate towards comfort and layers like dancers between practice sessions. I think I watched too much “Fame” growing up. I love the “luxe” inclusion, because it is a great way to do dressy casual. Thank goodness for sewing machines and fine fabrics. My 2012 resolution is to only buy the very best fabrics and stick with a few basic patterns. Your site is an inspiration for “Zen” sewing in that way. Thanks!